Meet “Easy Goin’ Dave”, otherwise known as ATC’s Inside Plant Manager. 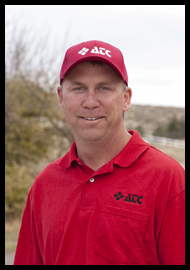 Dave started with ATC in 1993, where he originally oversaw our Malad, Stone, and Holbrook areas. In 2008, Dave relocated to our corporate office in Albion. Dave enjoys hunting and fishing with his dog, Max – but only when he can sneak away from his second job (building his own house). His favorite meal is antelope (and earthworms). Dave’s a real “people-person”, and enjoys visiting with customers as much as he does helping them with their communication needs. We are proud to have Dave on our ATC team.